The Friends have undertaken funding various projects over the years to benefit the Wildflower Garden. These projects are jointly worked out between the Friends and the Minneapolis Park & Recreation Board. These projects are funded from donations and memorials received by The Friends. A photo-sampling of the many projects funded by The Friends is presented below. Comprehensive chronological list at the bottom of the page. 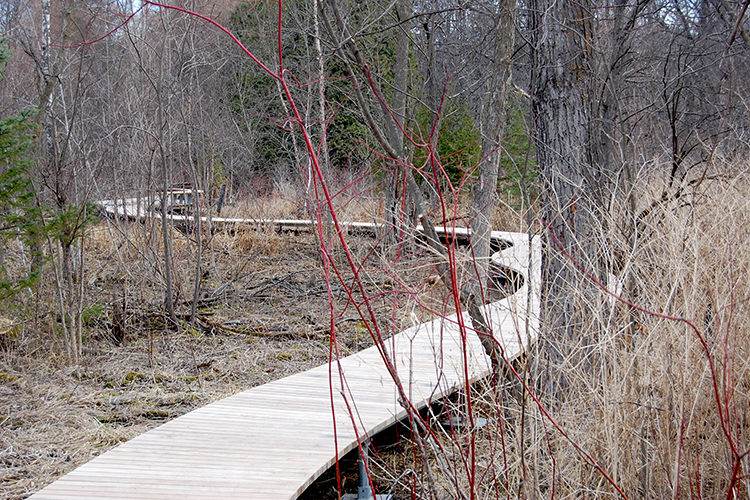 Phase II of wetland boardwalk - Details of project. Background: For a detailed history of this project. 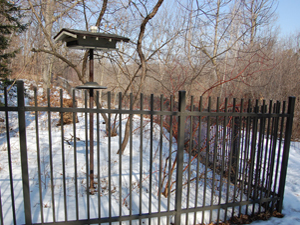 Click this link for information on Ken Avery and the dedication of the Ken Avery Birding Terrace. 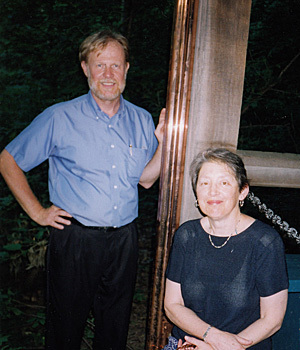 2004: Steve Pundt and Pam Weiner showing one of the new copper gutters for the Martha Crone Shelter funded by the Friends. 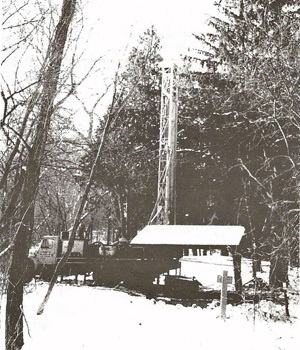 1998-99: The Friends hired Renner Well Co. to install a well to improve water flow at the old Great Medicine Spring. Details. 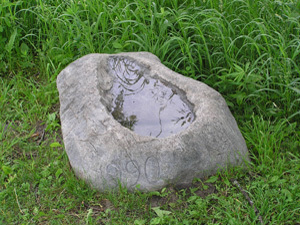 1990 - Acquisition of a boulder and sculpting it to make a birdbath (Funds from the Marion Grimes estate). Located on central hill in the Upland Garden. Details. 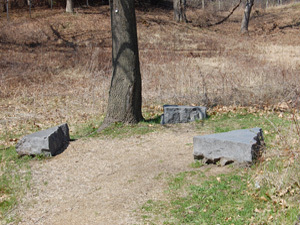 1995 - Purchase of three granite boulders for seating in the new Upland Garden area. 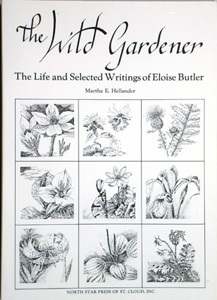 1989 - 1992 - Funding of the research and publication of The Wild Gardener, a biography of Eloise Butler, by Martha E. Hellander. 2001 - Funds for production of the new guide book. 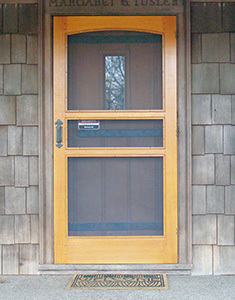 Garden Rustic Restroom Materials (1973), New Screen Door for Shelter (2007), new desk for Shelter (2017). 2019 - Completion of boardwalk phase II panels, installation and design fees - $21,181. 2018 - Fabrication of sections for phase II of the wetland boardwalk - $50,800 (Details); Prairie and wetland restoration - $3,469; Student Transportation Grants - $2,040. 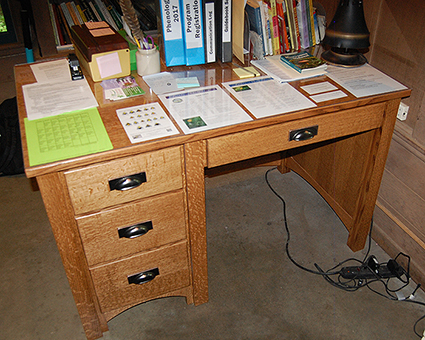 2017 - Completion of Shelter Desk - total cost $1464, Prairie and wetland restoration - $3,500. Student Transportation Grants - $2,040. Special planting around Shelter - $400. 2016 - Miscel. projects: Deposit on construction of a new desk for the Martha Crone Shelter - $500; kids backpack project - $139; support for Friends Invasive Plant Action Group - $192; Shelter furniture upkeep - $162; Student Transportation Grants - $2,348; Prairie Restoration - $975. 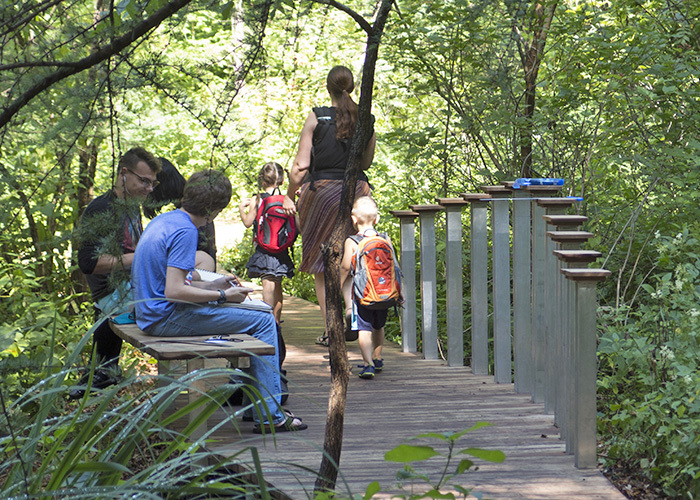 2015 - July - Installation of the Boardwalk as part of the Cary George Wetland Project. Details Here. Planting of 100 trees and shrubs on Geranium Path -$2,042. Details Here. Invasive plant control in the prairie and marsh areas - $5,125. 2014 - Design completion for the Cary George Wetland Project. $75,000 deposited with the Minneapolis Park & Recreation Board for design and construction costs. Details Here. $2,816 in funding for 752 students to visit the Garden. (Transportation Fund details). $500 to Minneapolis Audubon. $300 to Florilegiunm event, $300 to Junior naturalist program. 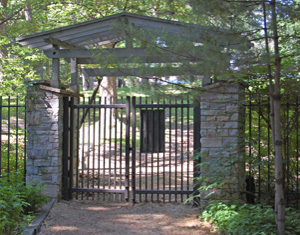 2013 - Funding for 646 herbaceous woodland plants for the Garden entrance and Trillium Trail. Details. $3,410 funding for 986 students to visit the Garden. $3,750 funding for the Bee Survey of the Garden - Details. 2012 - Funding for the acquisition of 2,850 wildflowers and ferns for the Violet Way Trail (23 species) and 152 trees and shrubs (nine species) for the Woodland Garden. $7,647. (Details). Transportation funding for students to visit the Garden - $705; Buckthorn removal - $740; Tools and storage boxes - $470. 2011 - Funding for the acquisition of 1,429 wildflowers and ferns planted in the east hardwood forest, uphill of Violet Way Trail. Seventeen species total, $2,645. Details. Transportation funding for students to visit the Garden, 2,343; other projects, $1,006. 2010 - Funding for the acquisition of 145 trees of 6 species that were planted by the Garden staff in selected areas of the lowland hardware forest in the Woodland Garden, $3,046. Details. Transportation funding for students to visit the Garden. 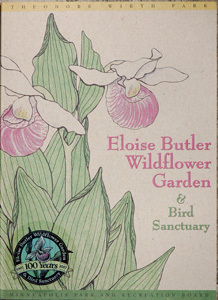 2009 - Funding for the acquisition of 1,460 herbaceous woodland plants of 26 species that were planted by the Garden staff in selected areas adjacent to Violet Way Trail (the East path in the Woodland Garden), $2,869, Details. Transportation funding for students to visit the Garden, $1,200. 2008- Acquisition of new trees and shrubs to restore the native shrub, understory tree and canopy trees in the Woodland Garden in the area near and north of the back gate. This area was previously cleared on invasive plants, primarily buckthorn, and this planting will fill in the openings. $6,705. Details. 2007 - Acquisition of new plant material for spring planting that will include a large number of spring blooming plant types such as Bloodroot and Wild Ginger. $4,250. 1998 - Purchase of two bike racks. Purchase of log splitter for the Garden. 1998- Funding for materials to repair and improve the Curator's work shed. 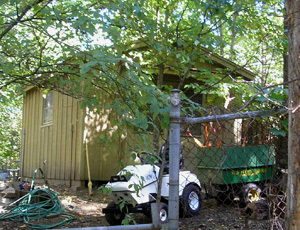 1996 - 1998 Funding for a new back gate, fence and gate area landscaping. 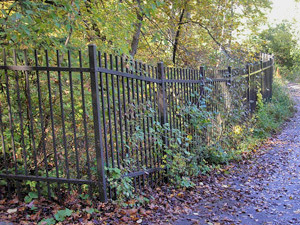 Additional fencing in 2005. 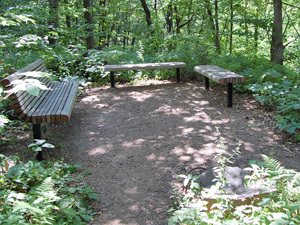 1997 - Funding help for replacing the back Garden trail from the Woodland Garden up to the Upland Garden. 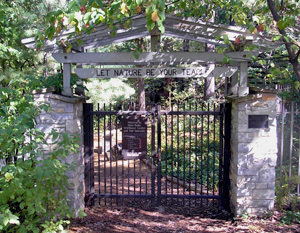 1995 - Funding for completion of the new back gate and wrought iron work on the gate; wrought iron fencing in the area leading away from the front gate. Photo above. 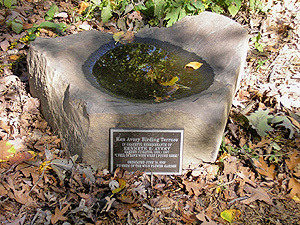 Funding for the Nordquist Fountain in the Upland Garden. Bookcase for the Shelter. Purchase of 3 granite slabs to use as seats in the Upland Garden new addition. 1994 - Funds for work on designating the Garden as a historic site. 1992 - Dredging of the Mallard Pool. 1992 - New Stove in the Garden Curator's Shed. 1988 - Purchase of a refrigerator and reference books for the Martha Crone Shelter. 1986 - Funding for a complete plant census of the Garden in preparation for issuance of a new guidebook, funds for a shelter alarm system and repairs caused by a break-in. 1975 - Funds to rehabilitate the old Front Gate to the Garden, add new steps from the parking lot and a handrail along the steps. Replacement for the stolen tape deck. 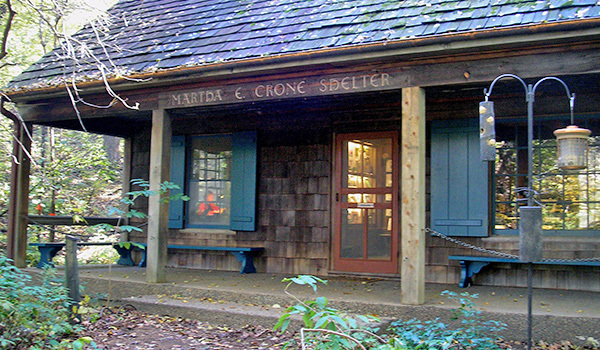 1974 - Funds to install lighting for the Martha Crone Shelter display cases, new fireplace doors and a chain saw. 1973 - Funding for the construction of the Garden Restroom near the front gate. 1972 - Funds for the purchase of a garden tractor. 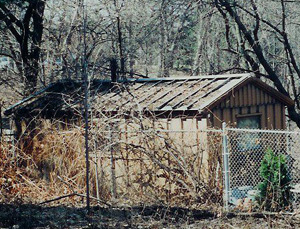 1955 - 1968 Prior to the construction of the Martha Crone Shelter, the Friends donated $500 per year to the Park Board to be used for Garden projects. Purchase of audiovisual equipment in various years. Through 2018, total dollars provided through the Friends exceeds $360,000.